Well, my obsession with vintage and hard-to-find designer favorites has reached absolutely astronomical proportions recently! It all started a few month ago, when I spotted a Chanel canvas tote in an old magazine and fell in love with it the moment I saw it! I looked for it everywhere, I think I called every Chanel store in US hoping they could find one for me, but alas, I got the same response wherever I called. The bag was no longer available, and my chances of finding one were pretty much slim to none. 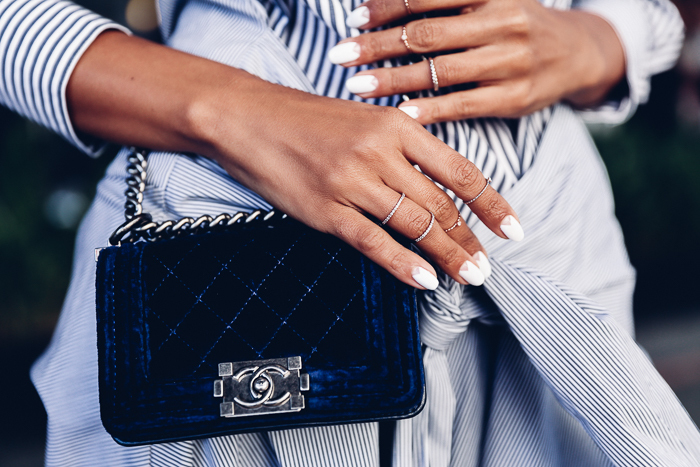 The first time my new canvas Chanel made an appearance on this blog, I've gotten quite a few emails asking what my experience buying designer second-hand was like, and the best advice I could give in this particular case is the following. If you're thinking about investing into second-hand luxury, buying from a trusted source is a must. Reason why I chose Trendlee is because they had a certificate of authentication, and a really good return policy which made me feel secure splurging on such a big purchase. 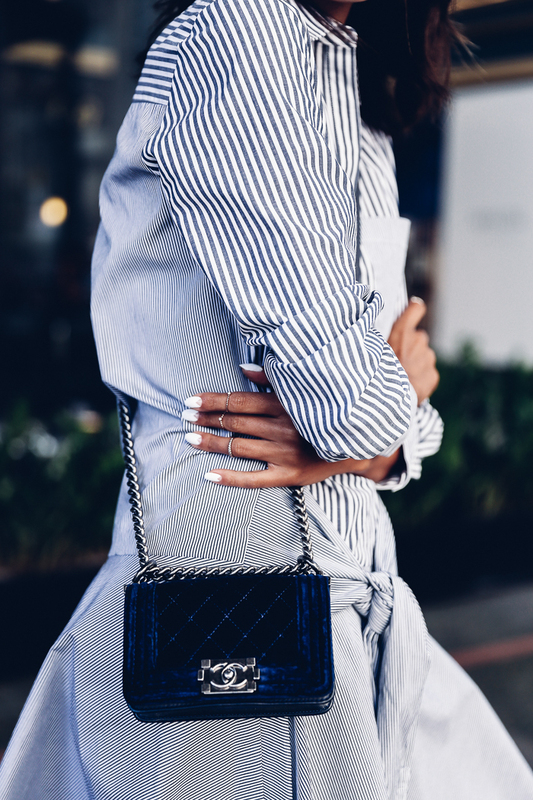 Today's cobalt blue velvet Chanel Boy bag is my latest Trendlee splurge! I've had my eye on it for about 3 year now, but had a hard time fining one in this beautiful vibrant blue color. Naturally, when I spotted it on Trendlee, I knew it was fate! Aside from color and the fact that I have a weakness for Chanel Boys in general because they have a completely magical ability to elevate any outfit, something about the size of this bag makes it particularly versatile! So good with any night-time looks, I also love the way it pairs with casual pieces and adds a bit of drama to simple everyday staples! Basically, I can wear it with anything! And of course you know what a fan of this particular quality I am! P.S. Use VIVALUXURY to get 5% off on --> Trendlee!